With a bit of knowledge, planning and a little time in the kitchen we can eat better, healthier and save money – all while bringing the family closer and teaching the kids how not to dig their own grave with a fork and spoon. The biggest obstacle to healthy eating is convenience; unfortunately convenient foods are rarely healthy. Eating-out is easy, and ordering-in fits the schedule nicely, but rarely are either nutritionally sound. Processed foods can go from box to table in minutes, but there’s little to nothing in that package we should be eating – I don’t care what the labels says! What does convenient eating cost? Thousands of dollars more per year for foods that are slowly killing us, and at the same time it reduces the most significant of family events to a quick feeding. Is a matter of minutes each day worth it? For starters, we need to eat more vegetables. Mom’s have been saying this for generations – and lo and behold, every scientific study, doctor and nutrition expert will tell you the same thing. The goal is to increase the ratio of vegetables on your plate to at least 50%, rounding out your meals with lean meats or fish and whole grains – and no fast or processed foods! First we need to have fresh vegetables on hand at all times, which means shopping at least once a week. In short: stick to veggies in season and choose the greatest variety of textures, colors and shapes possible – the bigger the variety, the bigger the benefits. Second, save time by prepping veggies in advance one or two times a week – that way they’re only a few short minutes from the table. If you keep a salad, cut fruit and steamed veggies on hand at all times, healthy eating becomes very convenient. I swear by this recipe, and you’ll be amazed how flexible and quick it is at suppertime! This vegetable selection is just a suggestion, try to cook as many varieties and colors as possible. Fill a large pot with 2 inches of water; bring to a boil and place steamer inset and lid on top. Or fill your largest pot at least half full of water and bring to a boil (steaming preserves more nutrients!) Prepare a second bowl filled with ice water. 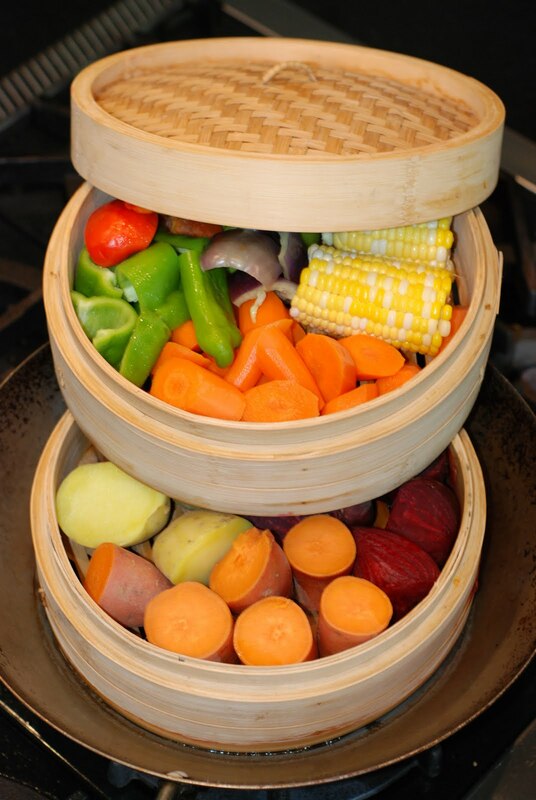 Wash and trim vegetables, cut into one to two-bite pieces and add to the steamer. Cook until crisp tender, remove to a colander, rinse under cold water and shock in ice water to chill quickly (stopping cooking and preserving color). Scatter on a clean towel to dry, transfer to covered containers and refrigerate. Chef’s Notes: For efficiency, start potatoes and as they cook, clean and cut carrots and then add to pot. As they cook, cut the next hardest vegetable and so on. I like to keep the varieties separate and suggest a Chinese bamboo steamer, they’re inexpensive and can be stacked for efficiency. Times for each vegetable varies – test early with a bite and slightly undercook – they will cook more when reheating. About the author: Chef Mick (Michaelangelo) Rosacci is the Corporate Chef and co-owner of Tony’s Markets in the Denver Metro area. Mick also teaches cooking on Denver’s Channel 7 News and Dig In, a local gardening show on FOX. For more recipes, visit www.TonysMarket.com and/or join Tony’s Culinary Club. Fabulous post! Thanks for the comment and the explanation of flat chickens. I'm getting ready to write up a post about your crab cakes and sinfully delicious creamed corn. I'll post the explanation for my readers there. As always, thank you Lea Ann – BTW, there is a photo of our crab cakes at http://www.flickr.com/photos/47484104@N06/4955044648/ – cheers!